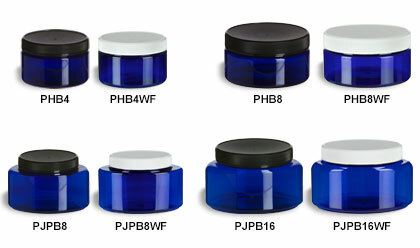 These blue PET jars are a great choice for packaging a wide range of products, including bath scrubs, salts, creams or cleansers. These stunning jars are available in two unique shapes. The oval and round styles provide abundant space for labeling and a wide mouth for easy filling and waste-free dispensing. Choose between a crisp contrasting white lid or a classic black lid. All prices include the jars and lids.